I am a cou nty councillor in Worthing, and from May 2012 I am a member of the Green Party. 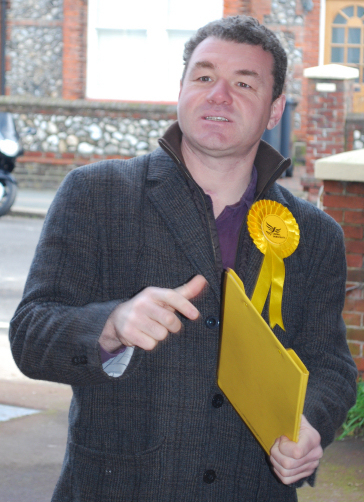 From 1993 to 2010 I was a member of and campaigner for the Liberal Democrats, serving on the Borough Council in Worthing from 1995-99, 2002-2007, and 2008-12, and standing as the parliamentary candidate in East Worthing & Adur in 2005 and 2010. I’ve lived in Worthing for over 20 years with my wife Mel, and recently with the addition of our son Luis and daughter Violet. I believe passionately in the great treasure that is the Sussex coast, and in working towards a better environment and community for the residents of Worthing, Sompting, Lancing, Shoreham and Southwick. From the Norwich Green Party website. Norwich Green Party was shocked by the news that Philip Hardy, Norwich Green Party County Councillor, defected to the Conservative group shortly before Christmas 2011. Norwich Green Party has been encouraging and supporting residents in a cross-party campaign to call on Philip Hardy to resign. Residents are being encouraged to telephone Hardy as well as email him in order to obtain a direct answer to their concerns and to call upon him to resign. (His mobile number and council email were published on this website). Claire Stephenson, Leader of the Green Party Group on Norwich City Council, stated, “I am very concerned about the lack of integrity in some political parties, particularly on Norfolk County Council, in enticing political opponents to join them and putting pressure on members of their own party across the county and undermining the democratic process. People cast votes for political parties and policies and Conservative policies are diametrically opposed to Green ones. Hi Ann – are you the Ann Saunders I know from Worthing Labour? Yes I am. I posted this piece from the Norwich Green website because the Greens oppose defections strenuously when they are from the Greens to another party, but nationally the Green Party welcomes defectors. Of course all parties behave like this to a certain extent. The Green Party have taken an ethical position against defections as people tend to vote for parties rather personalities. They have organised a campaign to force this councillor to resign while welcoming councillors from other parties. There is much traffic in Adur and Worthing between the LibDems and the Tories and now between the LibDems and the Greens. These councillors never resign. I often ask myself is there any real political difference between these parties if their leading members can move so easily between. Well, to be fair, I think all parties make noises of outrage when defectors leave them, and demand by elections, and all parties welcome defectors that join them. I would of course be happy for you to point out any recent defections where Labour have asked someone joining them to seek re-election. I’m not sure of the stats, but there are lots of Lab to Con and Con to Lab defections as well. And over the past year or so, quite a few LibDem to Labour moves – did you ask them to resign? In my case, I did think long and hard about what was the ethical course of action to take; that is why I am NOT sitting as a Green councillor – because I wasn’t elected as one. In fact, my understanding is that this is in line with the national green policy, but I’m sure there are local variations you could point out (as you have done).